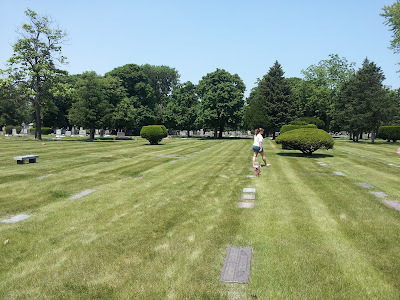 In the course of researching the Edgren family, I had reason to visit the Oak Woods (or Oakwoods) Cemetery in south Chicago. This huge 186-acre historic cemetery is quite overwhelming. However, their office staff were exceptionally helpful in locating the Edgren graves in question. Unfortunately, they didn't have record of the grave of most interest to me. They are limited to two look-ups, which I can understand. I am sure the demand is great considering the number of burials in this cemetery. At any rate, we found some of the ones we were looking for. But what I found more interesting was the old Jewish section of the cemetery. I was shocked at the condition of this section. The Oak Woods Cemetery is quite distinguished, representing the turn of the century tradition of designing cemeteries as parks. It is landscaped and well-kept. Except for the old Jewish section. This section is overgrown. Many headstones are overturned and crumbling. 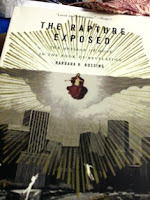 I've been reading this book - The Rapture Exposed - and have started pondering the beliefs that we take for granted. A few years back, when the Left Behind series of books came out, I read the first few, along with most of my evangelical Christian friends. I thought they were based on truth, because I had always been taught that the Bible explicitly described the Rapture... that it was TRUE. It's been a long time since I've found something really exciting in my own family tree. I have been working on mine long enough that all that remains are unfinished rabbit trails, dead-ends and holes. There are no more easy answers for my family tree... or at least none that I've found recently. But since I've been working on the Edgren family tree, I've been able to find some facts that the family didn't already know. I love that! There's nothing quite like being the first person to reveal a set of names that no one has heard before. I think that's why I like working on other people's trees. It's much more fun to start with nothing and gather a lot of "new" information for people than it is to search and search for some tidbit that you never saw in your own tree. Maybe I'm just lazy and prefer the easy "finds." Not maybe; definitely. A friend of mine just posted a blog that has made me pensive. In said blog, he explored a very sensitive part of his life that at one point in time involved me. I can't say I enjoyed the part I played in his "coming of age" - but I do still like him as a person. In fact, on a personal level I still consider him one of the best friends I've ever had because he's pretty much just like me in a lot of ways (and, let's face it, I think everyone should be just like me).